Happy Friday everyone! There’s nothing that gets my day going quite like a green drink. Before we moved out of our previous home, I would make myself one each morning but that totally stopped while we were building. Since getting settled into our new home, I’ve gotten into the habit of making my morning green drink again, and I can’t even tell you the difference I feel. 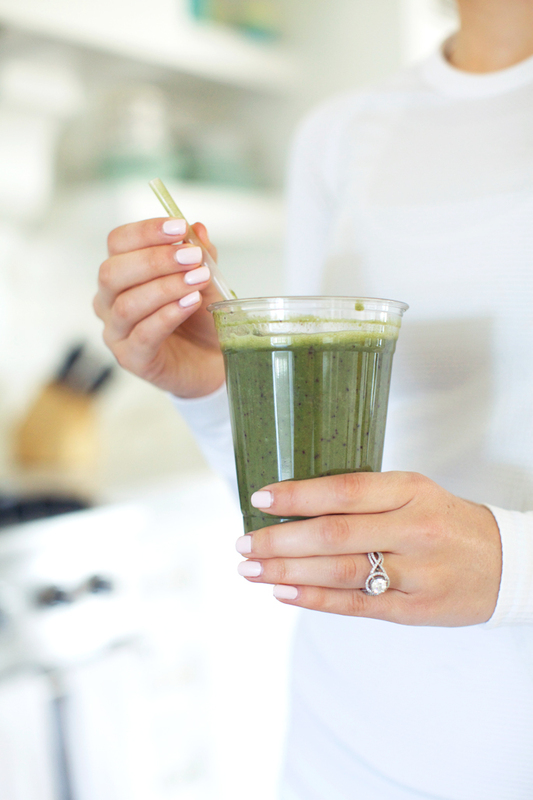 Today I’m sharing with you my favorite green drink recipe and one that I make almost daily (although it is fun to switch up the fruits and veggies). 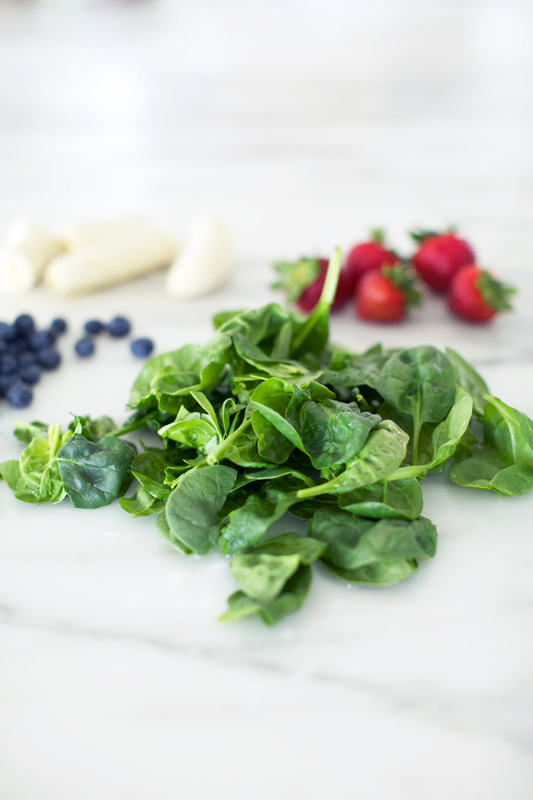 Place spinach and orange juice in blender first. 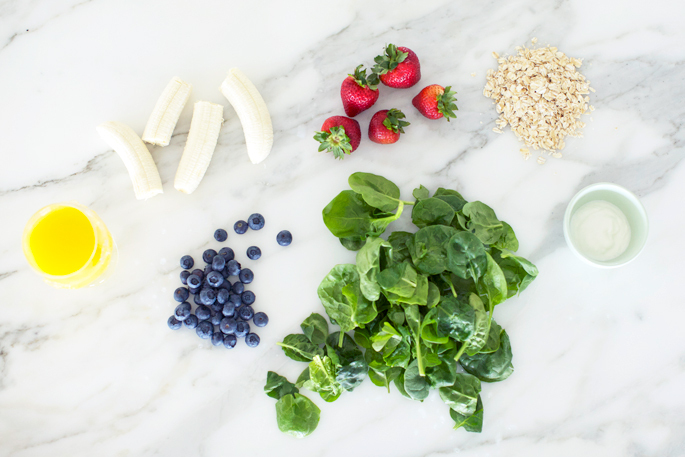 Place the remanning ingredients in blender and blend until smooth. You can replace ice cubs with freezing at least one of the fruits. On the days I do a long workout, I replace the orange juice with water and add a scoop of vanilla protein. this looks so yummy! Also dying over your kitchen! So pretty! wow! I love your outfit, especially your shoes! And that drink looks delicious. love this recipe will definitely try it out next week :) thanks Rachel! This green drink recipe sounds delicious!! definitely going to try it soon! 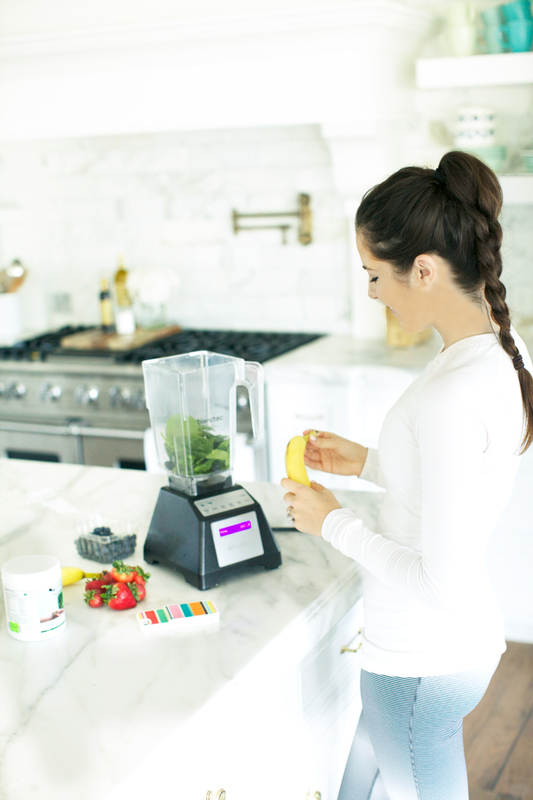 Love this healthy post and your kitchen Rach! I’d love to see a post on your workout routine. Fantastic!! Thank you so much for sharing. We have everthing on hand, so we’ll have to give this a try! Have a wonderful weekend! Great recipe, thank you, and I´m totally in love with your kitchen and new home. Thank you for your recipe- I will definitely need to switch mine up a bit. I’m not usually hungry in the morning, so it’s just perfect to make sure I’m getting what I need to start my day off right! It’s so fun that Friday’s have become a recipe day! And love those shoes!!! You did this exact post already.. Sounds delicious! I love starting my morning with a green smoothie. I haven’t tried making my own juices yet, but this summer I’ve really been enjoying making fruit smoothies… maybe I’ll give this a try too! I read this post this morning and just went out and got the necessities to make this for breakfast tomorrow morning! time to get back into that routine! Looks so healthy and refreshing! Love the recipe…. I make something very similar and it is delicious! Your kitchen looks amazing. I’ve noticed it in more than one of your posts… I’d love to see a house your post or video. This is my go-to every morning! It’s so cleansing and I love how I feel after I’ve had my green smoothie every morning. I also change it up a lot. Sometimes I add avocado which makes it creamier and even more delicious. Great post Rach! Very great post. I just stumbled upon your blog and wished to say that I have truly enjoyed browsing your weblog posts. After all I’ll be subscribing on your rss feed and I am hoping you write once more very soon! This sounds delicious and I love that you added oats! I’m gonna have to try that! I can’t wait to try this for breakfast tomorrow morning! recipe sounds great…will definitely be trying this one out! Yum! I keep looking for green smoothies that actually TASTE GOOD! I’m going to have to try this one for sure! Yummy:) I love smoothies in the morning!! What company did you go with for your cabinets? 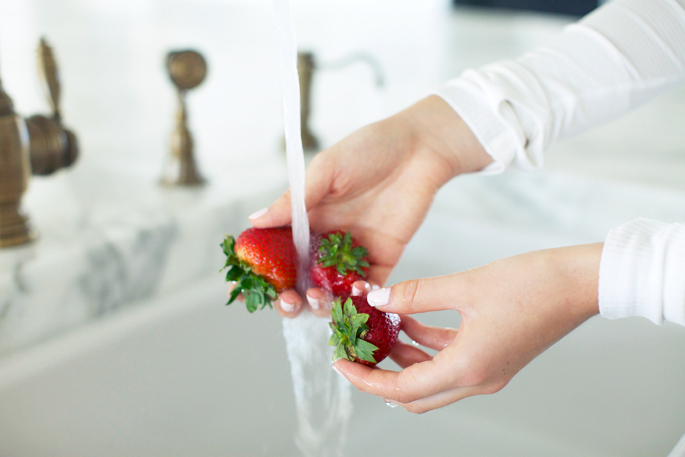 Would you please share your faucet sources? I’m looking for something just like this and haven’t had any luck with finishes. TIA!